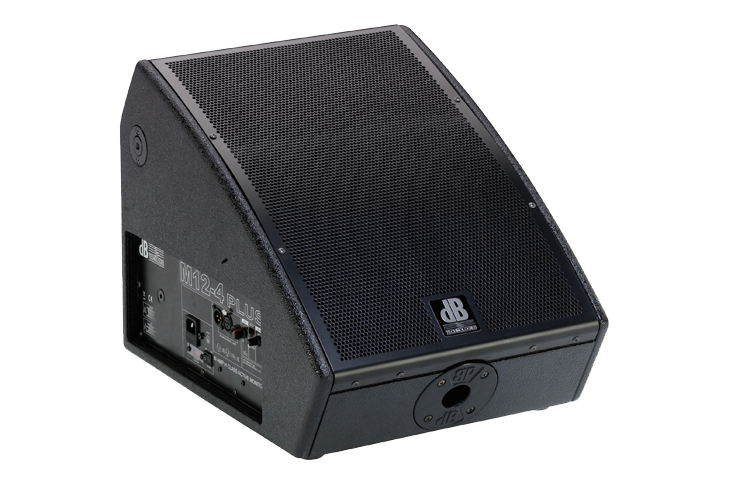 The dBTechnologies stage monitor M12-4 PLUS combines oustanding sound reproduction characteristics with high sound pressure levels in a compact housing. Because of the positioning of the high-quality components one above the other ( in phase ), M12-4 PLUS offers a high feedback resistance specially for microphone applications at a very linear set up over the full frequency range, which should make the sound loving musician very happy. The M12-4 PLUS offers an integrated pole mount and fly points which makes it a true multipurpose enclosure. The 12″ woofer and the 1″ compression driver with a rotatable 90°x70° horn, plus the 250+50W/RMS bi-amp power amp provide a superb sound quality. M12-4 PLUS offers a softclip-limiter in the input stage and a contour-controller for raising or lowering the mid-frequencies. The multiplex housing with black paint finish and rigid metal front grill with acoustic foam allow two different positioning angles. Voice Coil LF 2 "
Signal Input 1x XLR combo socket, sym.